You’ve done your market research, created a product that your customers love, and developed and implement world class production with top-notch quality. There is only one thing left to do: pack the boxes and ship the product. What are my options for case erecting, packing, and sealing? Should we just manually build and load the boxes, or should we completely automate? The reality is that case packing and the integration of end of line packaging equipment falls on a continuum from fully manual to fully automated. Full automating case erecting, packing, and sealing sounds great in theory and is used extensively for high-volume, low variation end of line situations. For these applications automation reduces head count and increases packaging line output. If the products and packaging are very consistent and run at high volumes then full automation may be the answer. Case and product variations product can cause end effectors and suction cups to jam and stop production. Buying automation and integrating it is expensive and requires skilled operators to setup, run, and maintain the equipment. There is also a time overhead to design, build, integrate, install, test, and debug and a fully automated system. Once up and running full automation requires maintenance and things like spare parts, down time for preventive maintenance. 100% automation isn’t possible for every situation. Something as simple as putting products in a box can have its challenges, particularly when the products are irregular, complex, or expensive. In these circumstances, conventional pick and place automation often doesn’t work well or can be prohibitively expensive. 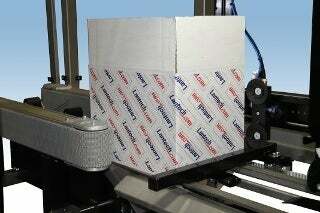 What if case erecting and sealing are automated and consistent and the packing is done by hand? A middle ground approach to automation allows the machines and people to do what they do best. The human/machine combination is the best of both worlds in that it incorporates what machines do best, rote work, and what humans do best, make judgments. People are flexible and when guided by informed judgment deliver adjustments on the fly. An operator can inspect a product as they are picking it up, and then insert it properly into a case or remove it from the line for future re-work or inspection. People make adjustments on the fly and deal with a wide variety of situations without causing the line to stop. A combination of people and automation works for low to moderate volume applications of up to ten cases per minute. On average, a medium sized case can be erected and sealed by hand in 20 seconds per unit. How many case per minute do you need? There are potential issues with a mix of manual and automation; including, the need to maintain the automation, the need for some mechanical infrastructure (like clean, dry air), and carrying spare parts for the automation. Are you running regular daily production? Do you have few changeovers? What is the impact of case quality and reduced defects in packing of goods? Do the net gains outweigh costs? Check out this video for an example of a hybrid approach using both man and machine for maximum end of line packaging efficiency. There is no one right way to build cases, pack them, and seal them for shipment. There is a range of options, and a hybrid approach can yield the best return in many situations. If you would like to talk to one of the experts at Lantech to discuss the right approach for your end of line packaging requirements, please contact us through the form on this page.